Once a month, I feature a chapter from my book and partner with the folks from MightyNest on a related giveaway. This month, I’m focusing on the health benefits of cultured foods. Read on to learn more about how nutritious these can be, and you’ll have the opportunity to enter a giveaway for beautiful jars in which to make your own delicious versions. Naturally cultured foods and drinks are teeming with vitamins, live enzymes, and natural probiotics (bacteria that are helpful for reducing the amount of harmful organisms in the intestines). These were prevalent in the diets of our ancestors, yet they’re not frequently consumed by most people today. Cultured (aka lacto-fermented) foods are good for everyone, but they are particularly useful if your digestion is poor or your immune system is weak (75% of your immune system’s cells reside in your digestive tract!). Cultured foods foster a healthy digestive environment, and contribute to optimal wellness overall. How lacto-fermentation works: Bacteria known as lactobacilli convert sugars and starches into lactic acid. The presence of lots of lactic acid results in a food that’s exceptionally nutritious and much less prone to spoilage. Before there was refrigeration and before foods were canned to extend their shelf life, they were naturally preserved in small batches using the lacto-fermentation method. Examples of lacto-fermented foods and drinks include yogurt, kefir, miso, kombucha, and vegetable preparations such as kimchi, sauerkraut, and lacto-fermented pickles. I try to include at least one serving of something that’s been lacto-fermented in my diet every day, but I eat more when I have any sort of digestive issue going on or on the rare occasion that I have to take antibiotics. You can purchase high quality versions of cultured foods at natural food stores, but I think knowing how to make your own is a good skill to have (plus you’ll save money). 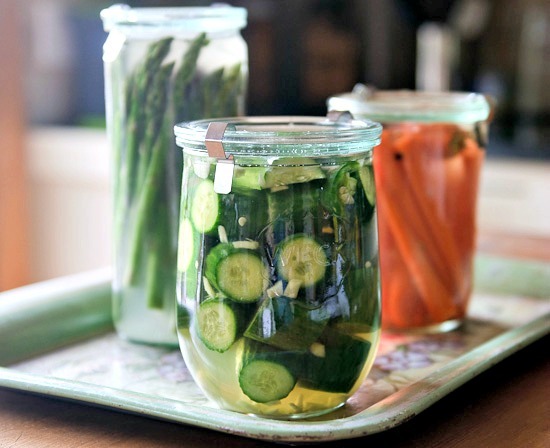 In the photos for this post, you see lacto-fermented asparagus, carrots, and cucumbers. I’ve included the recipe for the cucumbers below, along with some of my favorite fermentation resources. Lacto-fermented vegetables are a good place to start if you want to begin making your own cultured foods. These are particularly beneficial for you because they contain many nutrients as well as fiber: you can add them to all sorts of dishes as condiments. I’ve been making my own cultured vegetables for years: once you get the hang of the process, you’ll see how easy it is (you don’t need much more than veggies, salt, and a little time), and you’re sure to become hooked. Then you can look forward to always having some cultured veggies on hand to enhance your meals…and your health! According to traditional foods expert Sally Fallon (author of the book Nourishing Traditions), an ambient temperature of 72°F/22°C is ideal for making lacto-fermented vegetables. At this temperature, the process should take 2 to 4 days (if your kitchen is cooler, it will take longer, and if it’s warmer, things will speed up). These pickles are a little bit sweet and pack quite a bit of heat; I adore them and snack on them frequently. For this recipe, you'll need a 1-qt/960-ml glass canning jar with a lid made of metal, BPA-free plastic, or glass. To keep your pickles extra crisp, you can try adding something that provides tannins, such as a horseradish, oak, or grape leaf (I do not generally do this and I think the pickles are just fine). 1. Clean the glass jar in hot, soapy water, or use the hottest setting on your dishwasher. 2. Combine the cucumbers with the salt, fish sauce, maple syrup, jalapeño. garlic, and ginger in a medium bowl. Mix well, then transfer everything to the glass jar. If a few pieces of the cucumbers don't fit, that's fine; you can just eat them. 3. Add enough water (preferably filtered water) so the liquid covers the cucumbers. (The cucumbers may want to pop up over the brine, so to ensure they stay below it, I've started putting a piece of sliced cucumber over the top of the pickles as a "weight"...you can see what I mean in the top photo of this post). I discard the "cucumber weight" once I transfer the pickles to the refrigerator.) It's important to leave about 1 inch/2.5 cm. of room at the top of the jar before closing the lid. If you don't leave enough room, liquid may seep out of your jar as the pickles ferment. 4. Allow your pickles to sit at room temperature for 2 to 4 days. You'll know they're done when the brine begins to bubble; do not worry if the brine is a bit cloudy- this is completely normal (it's also normal for the hue of the cucumbers to darken a bit). Enjoy right away, or store in the refrigerator, where the pickles with keep for at least 2-3 weeks: the heat from the jalapeños will mellow a bit as they sit in the brine. Do you already make your own cultured veggies? To help you with the process, or to get you started if you are new, MightyNest will give one of my readers 9 beautiful Weck glass jars. These jars don’t have to be used for cultured veggies, of course: Weck jars can be for storage and decoration, for making pickles with vinegar, and they are also perfect for water bath canning. (They are made of thick glass to withstand boiling and sterilization. The glass lids are immune to rusting and can be used again and again.) The winner will receive three 1 liter asparagus jars, three 1 liter tulip jars, and three 3/4 liter molds (the photos in this post show one of each). The approximate retail value of this giveaway is $50. This giveaway is only open to readers in the USA and ends on 5/26/14 at 11:59PM Central Time. Please leave a comment on this post and pledge to add some culture to your diet via the widget below, and you’ll be entered to win the Weck jars. Good luck! What an interesting concept! I love pickles, but I’ve never thought to make them at home. Will have to try this summer. These look delicious! Thanks for the idea! I’ve never tried lacto-fermentation before. The tamari sounds like a great alternative to more conventional pickling brine. I’m going to make some of these today and the jars are beautiful. Awesome photos! The final product looks great. I love fermented vegetables!!! I can’t wait to start making my own. :-). The jars are so pretty and we homeschool, so winning the $1,000 would make a huge difference in my kids’ education. I’m a believer in the healing power of yogurt – I like the idea of some different foods to augment the yogurt in my diet. I love jars and don’t have any of these. Would love to try them, I use jars every day more and more. These are so beautiful! This has really given me a good way to start adding fermented veggies to my diet in my quest to get healthier! Thanks so much! I tried cultured pickles for the first time last summer, and I’m hooked. I hoarded them, they were so good! This looks like a terrific recipe and I can’t wait to try it! I would love to try these pickles! And great jars! I have always loved miso soup and recently discovered how healthful it can be after a very long antibiotic regimen. I’m sooo looking forward to making these delicious pickles! Thanks for all you do! I made kraut, kimchee, pickled asparagus and cukes last summer and plan to try even more cultures this summer. Love the jars! Those pickles look so great! I can’t get enough pickles, the spicier the better. I really want to try Lacto Fermented Salsa this year as well. And I’m trying to convert my kitchen to all glass so these jars would be so helpful. These jars would be great for my ferments! Jalapenos . . . yeesh . . . . can us wimps skip the peppers? I made my first pickles last year (sweet and kosher dill). They were very good, but I want to try these, too, plus some other veggies like carrots, beans, and asparagus. Love the idea of glass lids, too. I’m a school nurse and enjoy learning about healthy nutrition and sharing this information (and recipes) with others. 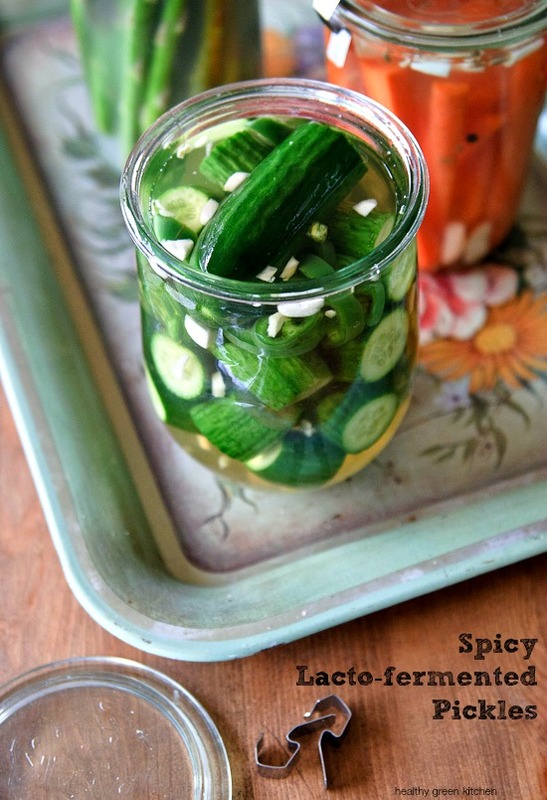 I love pickles and will be making this recipe over the summer. I have one of the very small Weck jars, and it’s both beautiful and functional. I’d love to have a set! Making my own femrmented foods is on my list! Thank you for the recipe! I have been wanting to learn about lacto-fermentation for a long while now…this sounds way easier than I was expecting, def gonna give it a go this summer, THANKS! I can’t wait to try the pickle recipe! I love to make my own pickles. I’ll have to try this method! We have big plans for a lot of fermenting in the very near future. These would be fantastic! Lacto-fermentation is a totally new concept to me and I am very interested. And canning jars with glass lids ? I’ve been looking for something like those. I am so glad I stopped by to check out your pages and read this article. Thank you so much. I make kraut all the time and love it! Have attempted kombucha but haven’t been able to make it work just yet. Pickles are on the list to try! Thanks so much for the recipe and tips! Oh I forgot to say the widget is not working on my browser. I’ve made yogurt and sauerkraut so far. Now, I’d like to try other fermentation. These pickled veggies look good for a next step! I love pickles! This sounds awesome! 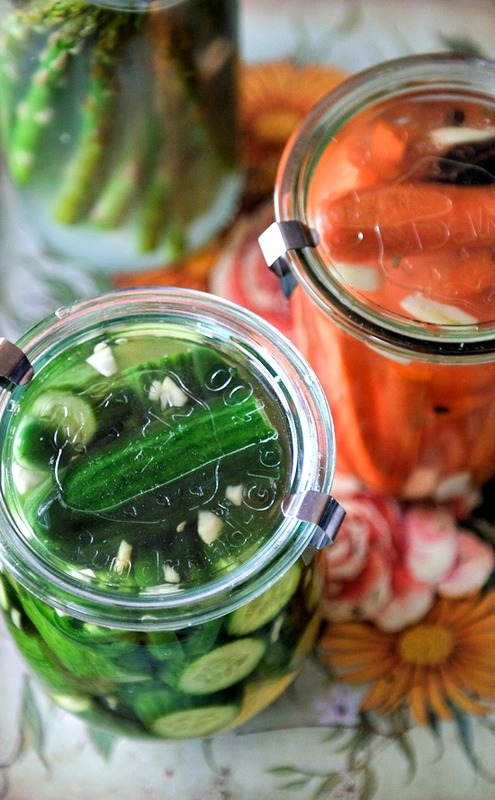 I have been thinking to start working more fermented food into my diet AND my kids love pickles, so I’m looking forward to giving this recipe a whirl, thanks. I love pickles, and have been wanting to try to make them myself. Your recipe provides just the inspiration I need to give it a try – thanks! I look forward to trying these. I’ve been wanting to make pickles and been thinking trying to get more fermented foods in my diet too. I’m definitely going to try this recipe. Thanks! I filled my garden with cuces this year, planning to make Lacto-pickes for the first time. Thank you for the easy “how to”! Here are a couple pictures of my latest batch I just put in the fridge. I have one jar still from last months batch that is all wonderlicious. I don’t use fish sauce anymore, I’ve found the taste is brighter without it and it reduces the salt content considerably. The last fish sauce I bought from the Korean Market, that had the LEAST sodium, had 10,000 mg per serving. Of course the serving size was 1/6th of the 1 liter bottle. Yikes. I’ve been making it so long that I don’t think much about it. Add 2Tbsp of salt, sea or kosher and 2 cups of filtered water. Let sit for 8 hours or so, turning the cabbage every hour or so…drain off brine, reserving some. Mix about 3/4 c of crushed korean red pepper with a handful of garlic cloves and about a Tbsp of ginger in the food processor. Change the blade to the shredder and run some carrots through it. Then I cut up some green onions into slices, mix all the stuff in with the salted cabbage and stuff it in to my 1 qt bail jars. Now you have to keep the food below the water line, so what I do is press down the kimchi with my (clean!) hand and use smaller glass jars that have been well cleaned to keep it down. (that is a “better than bouillon” jar you see inside the bail jar, they work perfectly) Then add brine until it is above the level of the Kimchi. It will bubble up and make a mess sometimes so keep a paper towel under them during the “it’s alive!” phase. I like having 1/2 cup with a cheese omelette with green onions and sesame seeds. Sorry got carried away there, I will definitely try those pickles. Last year my brother made zuchini pickles from his garden, they were very spicy! And strangely addictive. I am a big wimp when it comes to heat… you might want to add more red pepper if you like it hot. Adjust as you go. I have just gotten into the fermented food world. Been some good and bad recipes. Still trying. Can’t wait to try this one out. Thank you!!!!! Have a good friend who lacto-ferments almost everything in her garden! Have been wanted to get on the band wagon and try to make some pickled veggies too. I’d like to be able to share my bounty this summer. Just started lacto-fermenting but haven’t tried pickles yet. This recipe looks great! I drink kombucha a few times a week but I’d really like to start making my own and other recipes filled with probiotics! I have never tried this but I am heading out to the store to get the stuff to give it a try. It sound so divine! Thank you for sharing!! I have an addiction to jars and these would make me so happy. I’ve been making my own Kefir for some time and am just being introduced to fermenting veggies. Thanks for sharing your knowledge and recipes. I adore my weck jars, and would love to add to my (tiny) collection! And fermented pickles are easily my favorite kind. So much better than vinegar-based ones! Just started making water kefir. Can’t wait to try this!! These would be great! I’m just starting my journey to healthier eating and am wanting to add fermenting to my menu. These canning jars are fantastic! Would love a set to use for my homemade beauty products! Dealing with candidsias taught me so much about the importance of fermented foods! Thank you for sharing this post! I love preserving my home grow organic goodness the earth and sky provides. I would love these jars to encase the healthy goodness.Just beautiful and BPA free! I bought a Kombucha starter kit over the weekend. Theses jars would be great for my cukes this fall. And they’re so elegant! I am taking a sabbatical this summer and fermenting foods is one of my projects to take on, I have been buying fermented and really want to make my own. Wow – these are super easy! I have most of the ingredients on hand – and I do love pickles! I keep telling myself I need to get back into making the dilly carrots and try some other ferments. Doesn’t seem difficult at all. I need to add much more of this kind of food to my family’s diet. Going to take advantage of Chicago’s awesome farmers markets & try our hand at this wonderful (& healthy) project! I have been making my own kombucha for a few months now, and I am excited to branch out to lacto-fermented vegetables! I want to make more fermented foods… My hubs bought a HUGE crock for sauerkraut, and I would love to expand my pickle repertoire. 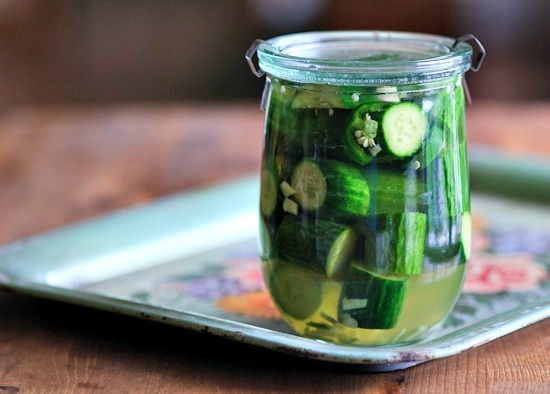 And let’s not forget kombucha…these pickles are definitely on my “to make” list when the cuke harvest starts!!! I have done water bath pickles the last few summers but am looking forward to trying fermented ones! I have been wanting to pickle for a while now. Going to start living healthier. I make a compact airlock for lacto-fermentation, and I keep hearing people talk about Weck jars (mostly in EU). Yours is the first article that has shown them and recommended their use! Love the good photos!